Gartner forecasted that the worldwide BI and Analytics market will reach a staggering $16.9 Billion in 2016. But perhaps more importantly, Gartner underscored and validated that we’ve experienced an evolution of business intelligence and analytics. The BI and analytics market is in the final stages of a multiyear shift from IT-led, system-of-record reporting to business-led, self-service analytics. As a result, the modern business intelligence and analytics (BI&A) platform has emerged to meet new organizational requirements for accessibility, agility and deeper analytical insight. First generation: The concept of self-service never went beyond vendor vision. As Gartner puts it, it was an entirely IT-led operation, from end-to-end. Second generation: Self-service BI tools like Tableau, QlikView and others hit the market. These players put the analytics in the hands of the business analysts, but they were still dependent on IT to get the data to a place where they could then work with it in their self-service tool. They were limited only to structured data and limited in big data use cases to aggregated, summarized, pre-processed data. Third generation: The entire process is self-service, or IT-enabled, instead of IT-led. This means time savings. This means cost savings. This means data-driven decisions can be made faster than ever before. 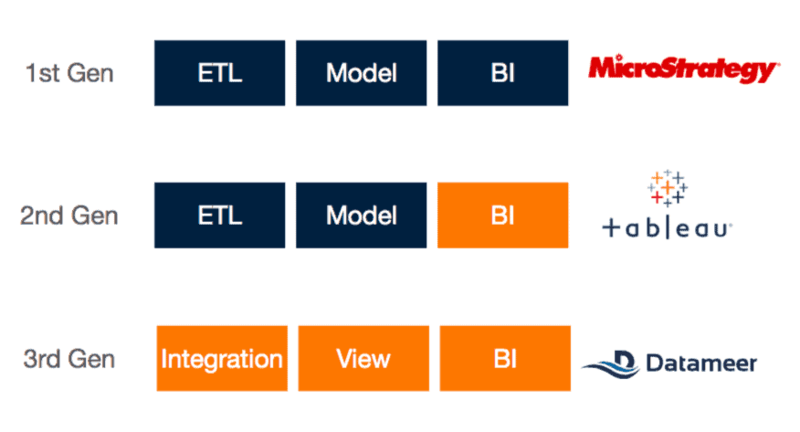 Where Is The Business Intelligence Evolution Heading? This is an extremely important evolution that will enable the next generation of businesses who want to truly become data-driven organizations. We simply cannot get to a new data-driven business paradigm without making the entire analytics workflow self-service. Today, Gartner released their 2016 Magic Quadrant for Business Intelligence & Analytics based on this new definition. Given our thematic alignment with the new definition, we are pleased to be included as a relevant vendor in the research, though we didn’t get a dot on the matrix. Why not? Quite simply it comes down to the qualification criteria. One of the (many) pieces of the puzzle was a need to have a quorum of customers in more than two major geographic markets. While we have triple-digit customers and amazing brands like American Airlines, Autodesk, Citibank, Priceline.com, British Telecom, Telefonica… (I could keep going…) if you’ve been following OUR evolution at all, you know we first aggressively focused on the U.S. market, and a couple years ago we entered the Western European market. Given this context and the timeliness of the MQ, it’s with particular excitement that just this week, we proudly announced we are now serving the Asia Pacific market. This news, not surprisingly, follows on the heels of our recent $40M investment from ST Telemedia in Singapore. We are “hitting the ground running” in Asia, and we couldn’t be more excited to bring self-service big data analytics, or a “modern BI & analytics platform” as Gartner puts it, to the Asia-Pacific market. So, for now, we’ll bring our own dot to the table while we get going in Asia. But, don’t take our word about the power of self-service BI & analytics. Let our customers tell you how it’s transforming their businesses.